The FT-64 is Digatron�s small, easy to use fuel indicator that performs two tests to detect the addition of oxidizers to a gas/oil mix. This is done by comparing the dielectric constant and the direct current conductivity of a racer�s fuel to a known base. Fuel with oxidizers added (such as methanol, nitro, etc.) will cause the instrument to register more positive than the base. This indicates some type of additive in the racer�s fuel. Under controlled conditions the FT-64, has proven to be an effective indicator for Methanol fuel. These tests allow the racing industry to keep the competition fair and safe. Test #1: The main test is used to detect the presence of illegal oxidizers in a fuel mix. It does this by comparing the fuel being tested to a known sample in which the instrument has been zeroed. 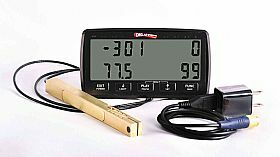 The presence of illegal additives will cause the instrument to read a positive number. The positive reading is proportional to the amount of additives in the fuel. Test #2: Performs a conductivity test of the fuel. This is an advanced test that may be performed by pressing the Test #2 button on the instrument. Test #3: Provides a temperature readout of the fuel being tested. This advanced test is performed by pressing the Test #3 button on the instrument.